Thanksgiving starters and sides are where my head is as we approach the holiday feast next week. My family has opted out of turkey (shocking, I know) and we’ll be grilling steak for an intimate crew around our table. 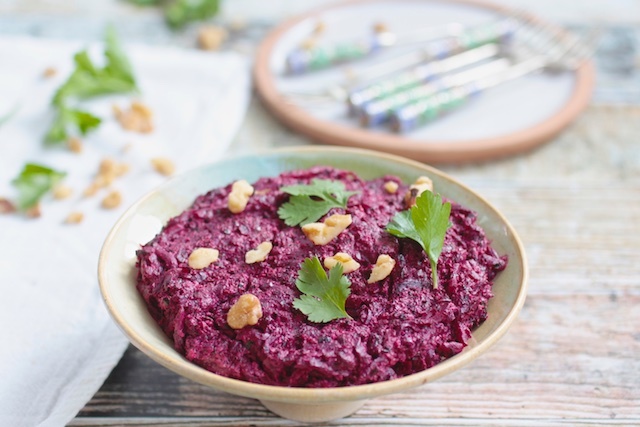 We’ll be starting with a seasonal, vegan and gluten-free beet puree called Charkhlis Mkhali. While we’ve easily found sweet CT beets growing at our favorite farms, this appetizer actually has roots in the far away country of Georgia. This region, which stretches from the Black Sea to the Caspian, has rich culinary traditions that range as widely as their topography and climate. I’m beginning to learn about the ingredients and flavors of Georgian cuisine via Darra Goldstein’s award winning and recently updated book, The Georgian Feast; The Vibrant Culture and Savory Food of the Republic of Georgia. Goldstein’s veritable love letter to the people and region provides an intimate taste of cultural customs (the feasts!) and flavors. 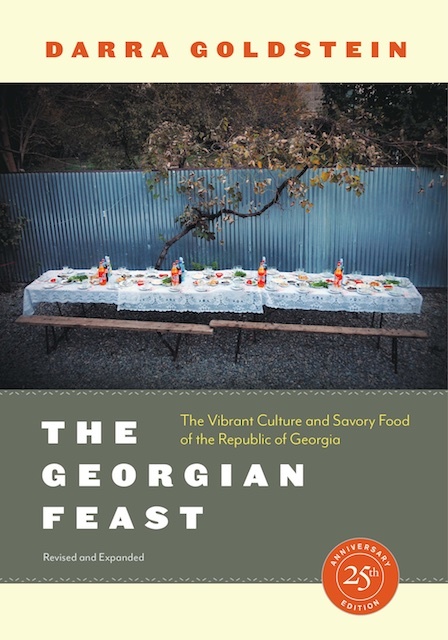 If you’d like to learn more about the foods of Georgia, please join me for a celebration of Goldstein’s re-release of her book, plenty of nibbles and Georgian wines, generously donated by the National Wine Agency of Georgia. We’ll be gathering in NYC on the eve of November 28, 2018 for a JDC Food Circle event. Our giving circle curates global culinary journeys in the NYC area as we explore cuisines, work with chefs, and learn about regions that JDC has impacted with humanitarian and lifesaving work. Photo: Liz Rueven; recipe for Beet Puree or Charkhlis Mkhali from The Georgian Feast. I’ll be preparing 4-5 dishes with my friend, Danielle Rehfeld Colen of The Inherited Plate. 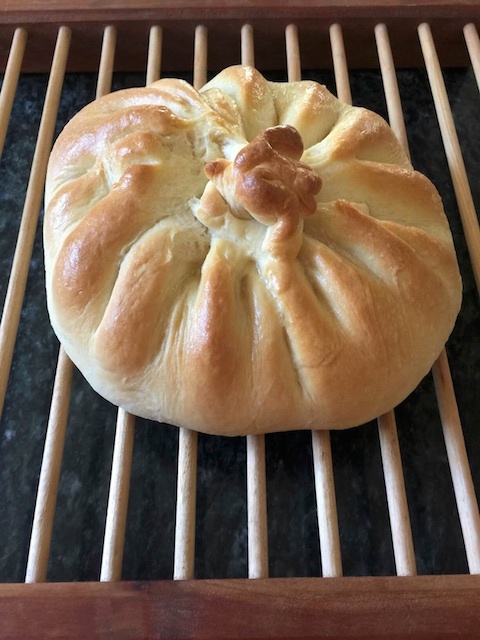 Be sure to click over to The Inherited Plate to learn more about JDC’s event and to find recipes for the herbaceous Tarragon Pie and Khachapuri (stuffed bread). The Georgian Feast; The Vibrant Culture and Savory Food of the Republic of Georgia is not a kosher cookbook. It contains a wide range of recipes with hearty chapters on vegetarian appetizers, soups, chicken (mostly suitable and all easily adapted), fish (all kosher), cheese and yogurt, breads, grains and over 30 pages devoted to vegetables, pickles and preserves. "A hallmark of Georgian cuisine is mkhali, a vegetable puree to which herbs and ground walnuts are added. Mkhali is made from any number of different vegetables, though spinach and beets are favored. Some of the most interesting versions call for radish and even cauliflower greens. Try experimenting with greens from the garden that might otherwise go to waste. In making mkhali, you must rely on your palate , since the amount of vinegar necessary depends on the sugar content of each given vegetable. The puree should taste sightly sharp, never vinegary. Scrub the beets but do not peel. Bake until tender, 1 to 1 1/2 hours. (If you are short of time, the beets may be boiled, but their flavor will not be as good.) While the beets are cooking, grind together the walnuts, garlic and salt. Add the cilantro and parsley and continue grinding to make a fine paste. Transfer to a bowl. When the beets are soft, peel them and finely grate them in the food processor. 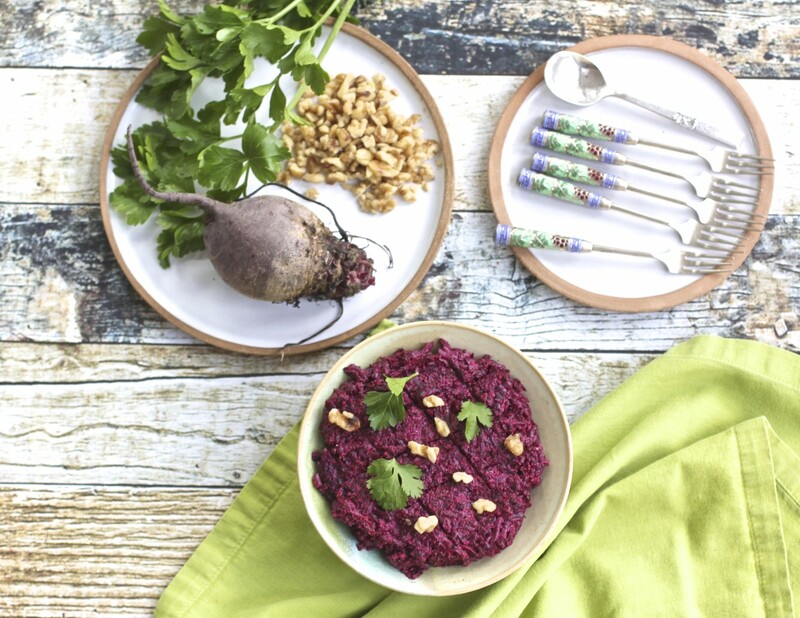 In a medium bowl mix together the grated beets and the ground walnut mixture, then stir in the dried spices and pepper an vinegar to taste. Keep tasting, as the amount of vinegar needed will depend on the sweetness of the beets. The mkhali should be slightly tart. Chill in the refrigerator for at least 2 hours, but bring to room temperature before serving, mounded on a plate and crosshatched on top with a knife. For leek mkhali, clean well 1 pound of leeks and cut off all but 2 inches of the green tops. Boil gently in salted water for 20-25 minutes, then drain and puree in a food processor. Follow the directions for beet mkhali, substituting 1 tablespoon minced fresh dill for the ground coriander. This sounds delicious and I love beets ! Thanks for the personal note, Valerie. I see that you’ve swapped in lemon for the vinegar. Sounds delicious, too.